May 17-19, 2019 – Applied Fundamentals Carbine – Paducah, Ky.
June 6 & 7, 2019 – Practical Fundamentals – Richmond, Calif.
Oct. 2-6, 2019 – MOAC Pistol – Paducah, Ky.
Nov. 8 & 9, 2019 – Advanced Pistol Marksmanship – Mesa, Ariz.
Dec. 6-8, 2019 – Applied Fundamentals – Okeechobee, Fla. The SIG SAUER® Armorer’s Video featuring Bruce Gray. 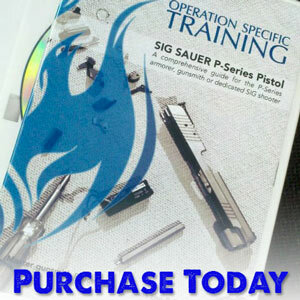 The video contains five-plus hours of everything there is to know about the SIG SAUER P-series pistols. Our course schedule is updated frequently. If you are interested in hosting an OpSpec firearms training course at your range, contact us today to get started. If you’re traveling by air – or ground – to an OpSpec Training class, you can find current information concerning flying and traveling with firearms right here. OpSpec Training offers private firearms training for law enforcement agencies as well as military units. Contact us to schedule a consultation.